ABS-CBN’s award-winning morning program “Umagang Kay Ganda” (UKG) is going all-out for mothers on its 10th anniversary with a lineup of offerings for the nation’s homemakers including a “Nanay Convention,” a “Nanay Manual,” and a new segment in the show featuring smart and talented moms called “Nanay Kong Ganda,” which will debut in October. The country’s well-loved morning show kicked-off its “Nanay Convention” series in Pampanga last July 3 and is now headed to Taguig City this Friday (August 18) to gather mommies for a day filled with new knowledge and tips on how to care for and protect one’s family. In the previous convention, anchor Gretchen Ho started it off with a simple workout to energize the crowd, followed by cooking demos with Chef Tatung and Winnie Cordero, a fashion and beauty talk with Renee Salud and Amy Perez, and a disaster preparedness seminar led by Atom Araullo, Anthony Taberna, and Jorge Cariño. Ariel Ureta also brought the popular “Di Bati” segment of the show, where the anchors exchange views on a common issue in families or communities. Participants also enjoyed free haircut, massage, and facials, plus fun games and raffle prizes courtesy of the program’s sponsors and partner organizations. “UKG” also launched during the convention the “Nanay Manual,” a free booklet containing recipes, kitchen hacks, and home safety and management tips that the program created with the help of ABS-CBN Publishing, Inc. Through these activities, the decade-long morning show hopes to further help and support mothers, which are the program’s partners in making each morning bright and happy for Filipino families. 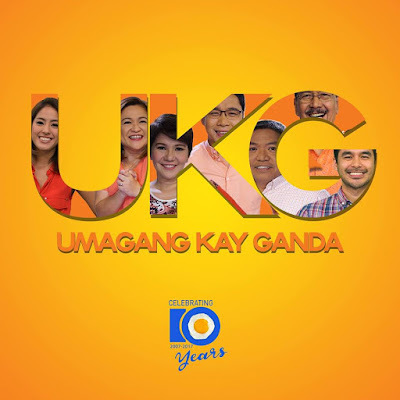 As for the program’s anchors, “UKG” has already become a home for them too, with their fellow anchors and the show’s staff and crew as their family. “Waking up for ‘Umagang Kay Ganda’ gives us happiness in itself. We are all family here. Even if we aren’t live on air yet, we already carry positive vibes which translates to our work. The positive energy is really inspiring and it sets the mood for our entire day,” shared Anthony, who has been on the show for a long time. Amy also attested to the tight bond among the show’s anchors, who are able to share with each other their personal triumphs and problems. “All of us are going through something in our lives but since we are in a morning show, we have to always show positivity to our viewers. So it’s good that during commercial breaks we also get to check on each other,” she said. While one of the newer hosts in the show, Jorge shared his amazement at how easy it has been to get along with everyone. “Here you bump into someone and you feel like you know each other very well, like childhood friends. That was the kind of treatment they gave me…People would mistake us as friends who have known each other for a long time. It’s magical for me,” he explained. Together with the program’s other hosts like Long Mejia, K Brosas, Marlo Mortel, Dominique Roque, and Tina Marasigan, the show is committed to be of service to millions of Filipinos for decades to come. Apart from consistently leading the early morning timeslot based on data from Kantar Media, “UKG” has also received many awards in the past 10 years, including “Best Morning Show” from UPLB Gandingan Awards and the 2nd Golden Laurel Awards of LPU Batangas in 2017. Don’t miss the NCR leg of “UKG’s” “Nanay Convention” this Friday (August 18) at Vista Mall, Taguig City. Registration will start at 5am, while the program will begin at 9am. Watch “Umagang Kay Ganda” Mondays-Fridays from 5am to 7:30am on ABS-CBN, ABS-CBN HD, and DZMM TeleRadyo on TV, or on iwantv.com.ph or skyondemand.com.ph online. For updates, follow “Umagang Kay Ganda” on Facebook (@umagangkayganda2) and Twitter (@ukgdos).